As promised, this newsletter will highlight the remaining three out of the six styles that MQBM makes! 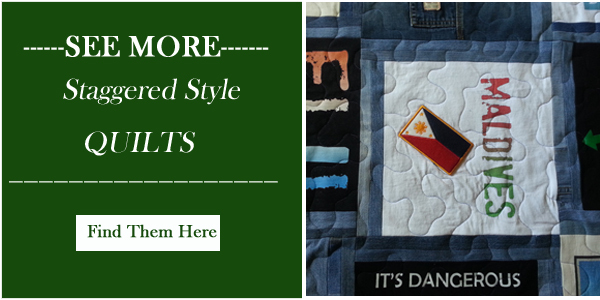 Yes, you have choices here and these choices make each and every Memory Quilt that is made that much more special! Graduation Quilts are in high demand. Currently I have 25 quilts on my schedule. 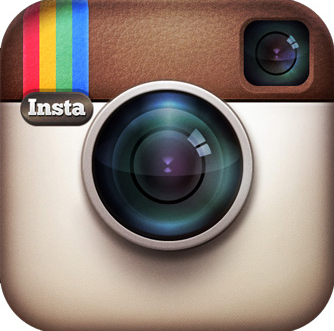 My shop is busy every day preserving your most cherished memories. If you are interested in a Memory Quilt or Memory Pillow for any occasion, please contact me ASAP so I can add you the list. 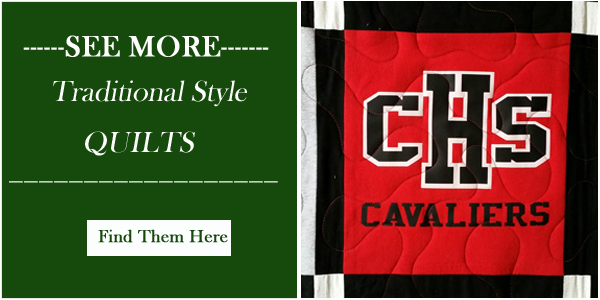 Now is the time to order grad quilts. 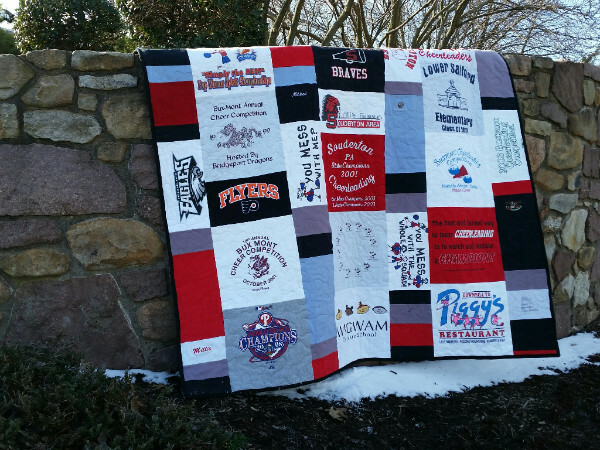 A Modern style graduation Memory Quilt made for a Souderton Cheerleader! Her special cheer leading jacket was included ;) Click here for more pictures. 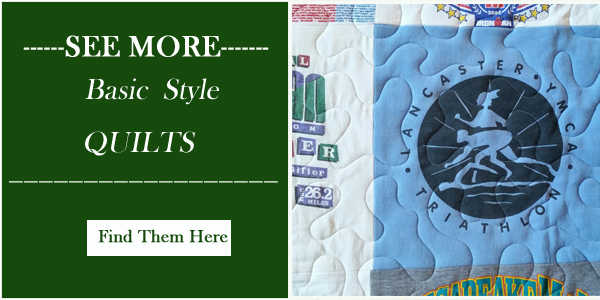 The Staggered style quilt is very popular! 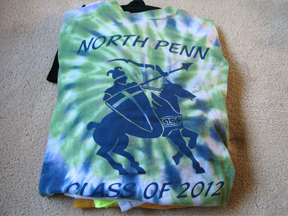 This style is good for shirts with large graphics. Each block is staggered slightly, hence the name ;) An extra-long twin size quilt in this style is perfect for a dorm bed. 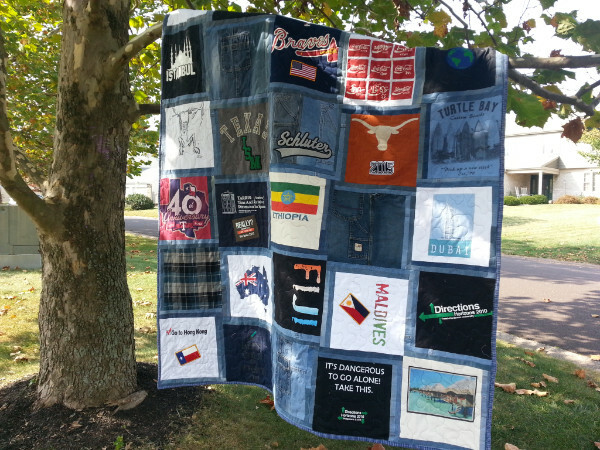 The Traditional style quilt with block sashing is also good for shirts that have large graphics. This style is less expensive than the traditional style quilt with premium friendship star sashing. It requires less labor. This style is very popular! 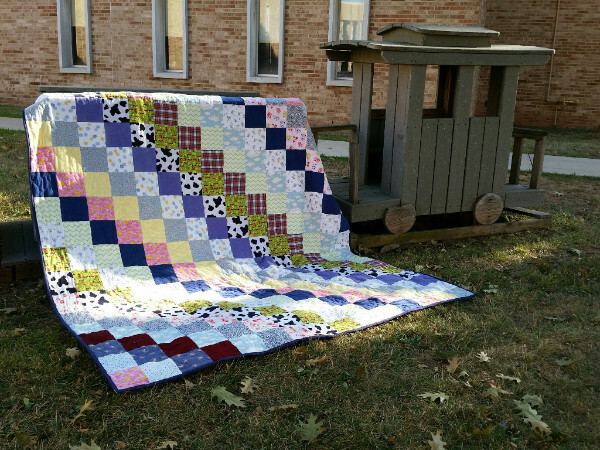 Re-purposing shirts and other garments into beautiful handmade quilts is truly recycling at its best! 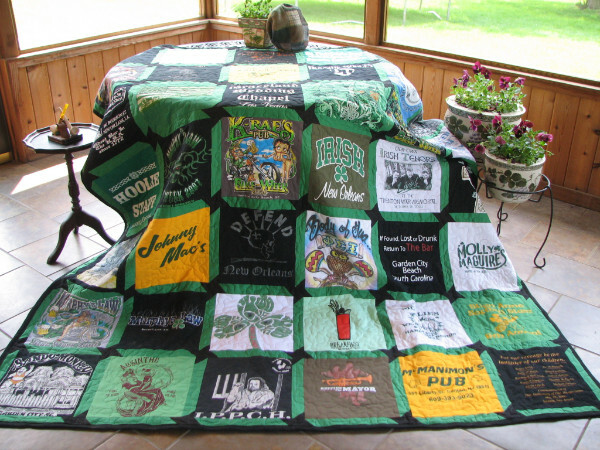 As you can see this Staggered style Quilt contains lots of t-shirts with large graphics. The sashing (fabric around each block) was made from the child's denim jeans! Who knew recycling could be so beautiful. 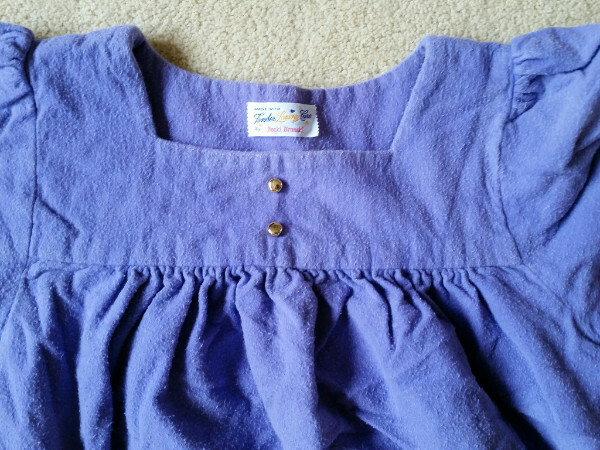 In December, MQBM received over 40 flannel nightgowns and flannel pants that were made with love for two children by their nanny. 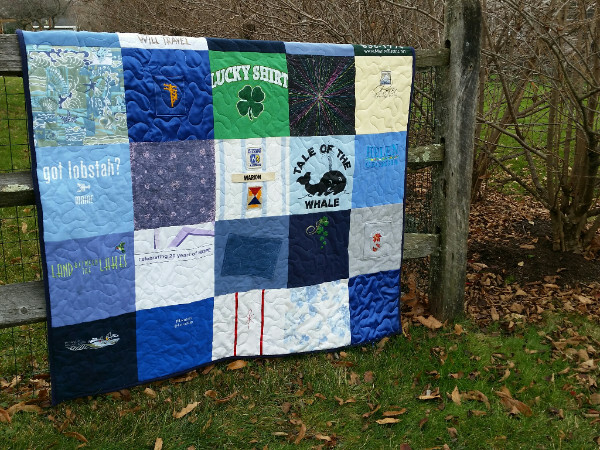 A large queen size Memory Quilt was made with them. 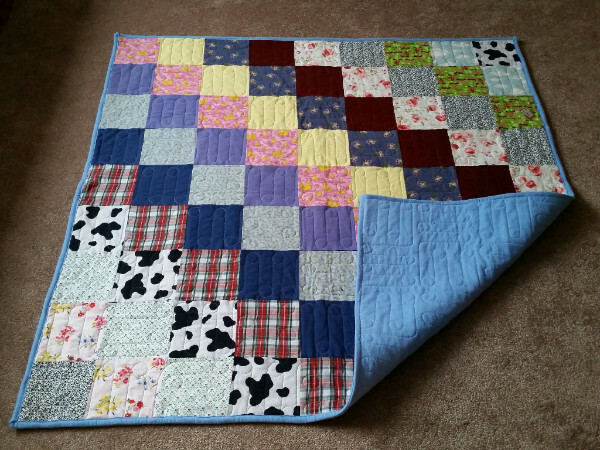 The customer loved the quilt so much that she ordered two baby quilts to be made with the leftover material-one for each grown child. It is her hope that these baby quilts will be used in the future for her grandchildren! So cute! The picture above shows a baby quilt that measures 54" by 54". The quilt below is the queen quilt that measures 90" by 108". What a precious gift for a baby shower! Currently the second baby quilt is being made with, you guessed it, a purple backing for a baby girl! Pillows made from cherished sweaters have become very popular. They are backed with the back of the sweater. 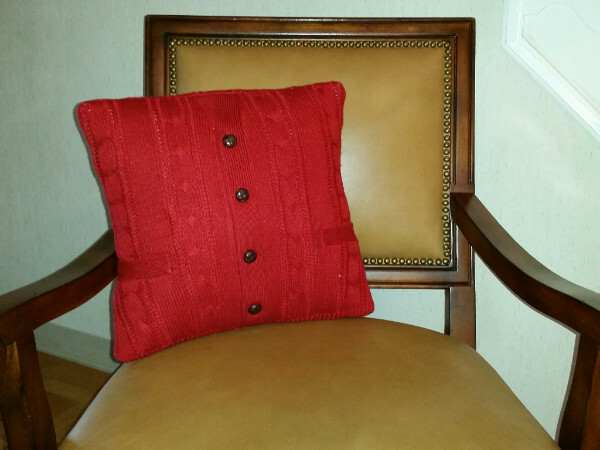 These pillows have a unique "hugability" to them that brings comfort to those who have lost loved ones. Happy St. Patrick's Day! May you all share a Guinness at your favorite pub!